You can make a payment, or renew your current plan in AMP, at any time. All bill items auto-renew by default, and you are notified (by email) 30 days before the renewal date. You also have the option to change the subscription length as well (for example 1 year vs. 2 years). You can find information about that on this page. In the main menu, move your mouse over Billing, and click My Subscriptions. You will see a list of all your bill items, click the green symbol in the Renew Now section. You will then be on the "Confirm Products to Renew" page, and will see a list products to be renewed. Click the "X" next to an item if you want to remove it, then click the Process Renewals button. You will then be on the billing page. Review your billing information for the renewal, you can also enter a new credit card on this screen to change the payment method. Once you have confirmed the information click Submit. A confirmation page will display to confirm your successful renewal. Please note: If your account has been suspended, certain features within AMP will be disabled. Please contact us for further assistance. How Do I Confirm My Billing Charges? Sorry for the issues with renewing your account. Please contact our Customer service department for assistance in resolving payment problems. How can I cancel my suscription? I dont want to renew my suscription again and I can't find a clear and easy option to do it. You must contact Live Support so they can set your account to expire. All accounts are set to auto-renew by default so websites/domain names don't go down. This is covered in our article How can I cancel my hosting account? Is there a way to turn off auto renewal of hosting? Yes, simply submit a ticket request to cancel auto-renewal. Our billing team will then make the change for you. My Customer would prefer to pay 10 years for hosting, It has option to do that ? Thanks for the question. InMotion currently provides up to 3 year subscriptions that can be paid in advance . 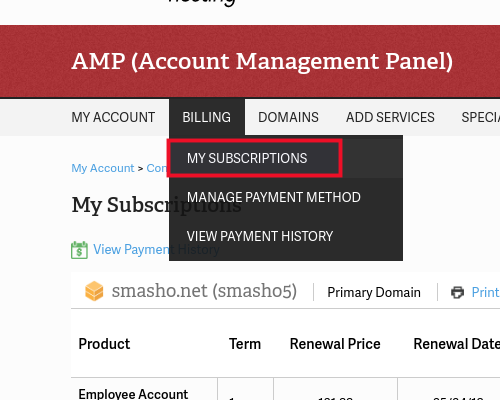 You can select that option in the Account Management Panel (AMP) and get the discount included. The plan automatically renews. Our Pro plan is the only shared plan that can be renewed for less than a year. It has a single month or 6-month option. Check out the link here and click on the "Order Now" button to see the plans. You are not obligated to purchase by clicking that button, it just shows you the options. I want to know how to stop a domain because I don't want it anymore? Typically, domains are registered a year or more. So, if you don't want it, then you can have the registration expire before its next renewal. If you have registered the domains though us, then you can contact the customer service department for further assistance. They can also help to immediately delete an unwanted domain through our domain registrar. You can also contact our live technical support team for help with that issue. Our support team is available 24 hours a day / 7 days a week - via email/chat/phone. If you registered the domain through another service, then you will need to contact them for assistance. I am trying to renewe my subsricptiion of $38.97 but i get an "insufficient funds". Since my site has been suspended and I need it to be back online what amount would i need on my card for this payment to go ahead? Thank you for contacting us. Since this is just our public forums, we cannot provide account specific information here. Please contact our Billing team, so they can assist you with renewing your account. I would like to make payments prior to my hosting renewal date so that the total amount is not all due at once. Does your system allow for that? Pls advise. Thanks! Thank you for contacting us. I recommend contacting our Billing department, so they can help you make a partial payment. Our system only repeats the codes it is given. If the card will not go through you will want to check with your bank to see why. Is it possible to renew and use a coupon code for a percent off of the yearly price of your hosting service? That is a question you will want to check with our Customer Service team on as they know how the different codes and coupons work. If the domain & hosting account payment is overdue for 3 weeks due to credit card payment problem, how can I restore the web and all web data & domain name kept ? Sorry to hear about these problems.This type of issue must be handled on a case-by-case basis, due to your individual circumstance. Please contact Live Support, so they can review your specific account and help you personally. Include how to find out when current plan expires. Thank you for contacting us. Since all accounts auto-renew by default, bill items will not expire unless you request it to be set that way. This is to avoid a lapse in billing, resulting in your website going down. If something is set to expire, it will occur on the Renewal Date. Thank you for contacting us today. You can regain access to your account, by logging into AMP (Account Management Panel). If you do not know your AMP password, you can reset it through email. I also sent an AMP login email to the address associated wit your account. If you are still having trouble, please contact Live Support, so they can help you regain access to your account. I'm working with a non-profit organization that does not have a credit card. Their members rotate in/out every few years and they would rather not use personal credit cards. What are their options for payment? We do have conditions under which we can accept Paypal as a payment option. You may want to contact our Billing department to see if you qualify. Thank you for the quick response. I will contact the billing department today. Unfortunately, our system is not set up in a way to allow billing without a card on file. Is there any option one can pay on a direct link instead of saved card on file i.e, considered MANUAL payment and not accepted by bank and in not secure.